Wouldn’t have believed it if I hadn’t seen it with my own eyes. #myNYPD in Interceptor ticketing cyclists in Manhattan Bridge. Just crazy. You read that right: While the driver who brazenly struck and killed Matthew von Ohlen last weekend has yet to be apprehended, police officers are handing out frivolous tickets to cyclists on the Manhattan Bridge. Police are stopping cyclists on the bridge for riding without a bell, according to several accounts on Twitter. So far this year, motorists have killed 12 cyclists on New York City streets, an increase from five at the same point last year, according to the New York Times. 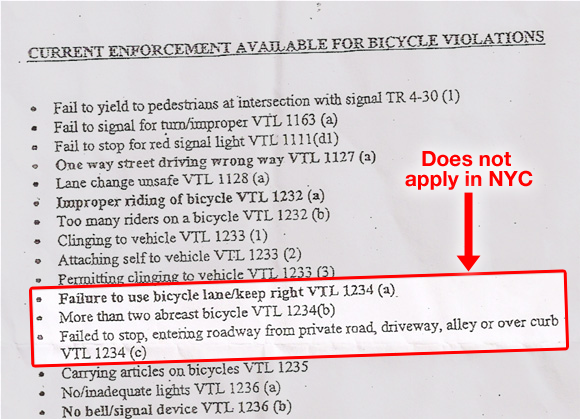 Other than a one-week initiative in May to keep bike lanes clear of motor vehicles, the NYPD hasn’t updated its usual approach to “bike safety” — ticketing cyclists who break the letter of the law but don’t endanger anyone. Even after a driver was shown on video deliberately running over von Ohlen, inflicting fatal injuries, the local precinct responded by ticketing cyclists and handing out flyers. The Manhattan Bridge is shared by the 84th Precinct in Brooklyn and the 5th Precinct in Manhattan. To the north, officers from the 9th Precinct were also seen doling out tickets at First Avenue and 12th Street. We have an inquiry in with NYPD to determine if today’s ticket stings were a coordinated enforcement action or the work of precincts acting independently. But regardless of who initiated these bike ticket blitzes, they point to NYPD’s institutional failure to mount an effective response to deadly driving that threatens New Yorkers. NYPD: It’s not about saving lives. It’s about giving tickets in order to get revenue. To NYPD, vision zero means zero jaywalking, zero cyclists, and zero respect. At least this morning they had one of those 3-wheeled enclosed “Interceptors” (like BrooklynSpoke said) parked at the wider bit by the tower closer to Brooklyn. Keep pedaling, everyone! Be safe and smart out there. Let’s stop being their low-hanging fruit and take away their reason to ticket us. The reason is bigotry and discrimination. Good luck taking that away from them. But ticketing cars is haaaaaaaaard! No. The real lesson here is that we, the people of New York, cannot trust the NYPD to protect us in any way. As Mr. von Ohlen discovered, it doesn’t matter to them whether or not we follow the law; it doesn’t matter how vulnerable we are, or whether the motorists who kill us do so with clear murderous intent. The NYPD, under Bratton, will always side with the abusers against the abused. The NYPD gives us no choice but to take the law into our own hands. We must defend ourselves and each other, using whatever tools we have on hand, against the violence of motorists and their allies in the NYPD. The only justice is street justice. Just came over the bridge. 115 pm. He’s still there. Interceptor too. Riding without a bell? Hello? Shouldn’t the cops be making better use of their time? The police must be channeling SNL today. This is literally the most pointless low-level infraction to go after in the entire city. I would be very interested to know if there have been any tickets or arrests made related to the 12 cyclist fatalities this year. As many of these tragedies were immediately deduced by the NYPD to be the cyclists fault, which was typically disproved, what was the NYPD follow up? Specifically the cyclists killed where failure to yield, hit and run and speeding were the factors. Does Streetsblog have this info? Cops won’t enforce the law and DOT won’t change the streets. One easy, non-violent option for people to get “street justice” would be for people to do their own DOTr-style interventions all over the city. Cones, spray-paint, whatever it takes to protect people. It’s not a pointless infraction, if the “point” of enforcing it is to harass cyclists, many of which likely either don’t know about the requirement or aren’t in compliance with it. I have noisemakers on my bikes, but I half expect to be pulled over at some point and ticketed because it’s not a literal “bell” (it is, instead, a trigger-activated electronic horn). Also the truck drivers who killed Leah Sylvain and Heather Lough were apparently arrested. Do they actually make every cyclist stop and check for a bell? Seems like a violation of the fourth amendment if they do. If I really want to get peoples’ attention, I don’t bother ringing my bell. I yell, “HEY HEADS UP!” That this is a law they can ticket for is ridiculous. I’m guessing they can claim that because they can’t observe a bell they have probably cause to stop to ask you. Of course you’re legally supposed to have a working horn on a car which is something you can’t visually observe and I’ve certainly never heard of anyone ever being stopped by police to check on that. Why don’t the cops set up a bell give-away station instead. Would be more useful. Anyone know if the WNYC Mean Streets has a counter for 2016? The could have a sign up which says “Ring bell when passing police officer” if the idea is to catch people without bells. Still an appalling waste of police resources but at least you’re not stopping everyone. I really think cyclists need to have their own police force at this point, something like the Shomrim. Not only is the NYPD not willing to work constructively and build relations with New Yorkers who ride a bicycle but they are actively making cyclists less safe. They are actively blaming victims before investigations are complete, they are actively trying to excuse bad driver behavior and they are part of the problem of bad driver behavior, they look for any minor reason to ticket and harass cyclists. We need a new group who actually cares about cyclist’s safety to be in charge of policing. Maybe you’re new here… if you think cops need a ‘reason’ to ticket, or harass, you are delusional. This is a sickening insult. Are they looking up vehicle registrations for a black chevy Camaro with NY plates? I have a very loud, electric horn that seems effective in getting people’s attention, particularly if I use it in a way that helps convey my approaching speed. But yeah, usually I just say something. A typical ringing bell would be ignored in most of the situations I need it. You can’t be compelled to use your bell in order to avoid a stop without probable cause. Gotta better idea: we make the NYPD responsible to and drawn from the constituencies they serve so they have a vested interest in protecting their fellow citizens and not just the tribe they were born into. I’m still trying to choke down my own vomit after reading that you see the Shomrim as an example of successful policing. This is probably what the COs hand out at roll-call, in order to quickly meet their quota. Now, everyone has all the cheat sheets. While absolutely not perfect, Ireland is a far better and safer place to cycle. ‘carrying articles on a bicycle’ ????? Seems reasonable enough. Of course, the cops don’t know anything beyond what’s on the cheat sheet, and have been known to ticket people for hanging a bag from the handlebars. The NYPD is just a better organized, better armed gang of thugs. So he drove in an area he wasn’t allowed, killed someone, and gets ticketed for regulatory violations? Thats like shooting someone and getting a fine for lacking a hunting license. It’s time to elect a mayor who will shut down the crime gang in blue. It’s not OK for a thuggish mafia to terrorize the city. Is the cop car legally or illegally parked? I believe that’s illegally parking a vehicle on the bicycle path. The crook in blue needs to be ticketed and arrested, and his illegal vehicle towed. Who’s in a position to do that? A Brooklyn man was arrested and charged yesterday for the death of Matthew von Ohlen, who was killed last summer as he rode his bike on Grand Street in Williamsburg by a motorist who left the scene.